It's like a classic for the jersey today, as the Tour foregoes a prologue and gives the leader's jersey to the first man to finish a 197.5 kilometer stage in Brittany, the far west of France. To borrow from Liggett, this one's got a sting in the tail, as there's a tough climb up to the finish that would seem to preclude the field sprint experts and throw things toward the classics specialists and sprint opportunists like Zabel and Freire. Eight riders went away early: Jegou (FdJ), Voeckler (Bouyges), Auge (Cofidis), de La Fuente (Saunier Duval), Perez (Euskaltel), Arrieta and Lequatre (AG2R), and Schroeder (Milram). Their gap got up to 8:15, but has been creeping down for 70 kilometers. There are polka-dot points up for grabs today, and it looks like Thomas Voeckler may be chasing them. First rider out of the Tour is Herve Duclos-Lassalle of Cofidis. Son of longtime pro Gilbert Duclos-Lassalle, he fell and injured his left wrist. One interesting change to this year's Tour is that there are NO time bonuses available, either at intermediate or finish lines. You can get an idea of which teams feel like they've got a chance at the finish by who is working at the front to bring the break back. Today, that's Rabobank (for Oscar Freire), Caisse d'Epargne (for Alejandro Valverde), Liquigas (for Fillippo Pozzatto) and Credit Agricole (for Thor Hushovd). With less than 40k to ride, the gap is down to just over 2 minutes. The gap has continued to drop. As it approached 1:30, the break started to splinter, with Auge and then de la Fuente attacking. Jegou was the only one who could bridge to de la Fuente, and the pair have kept about 1:30 on the field, while their 6 compatriots have been reabsorbed. Jegou and de la Fuente were caught with about 7 kilometers to ride. At almost the same moment, a crash in back took down 3 Barloworld riders, including last year's King of the Mountains, Mauricio Soler, who has said he hopes to ride for yellow this year. He's seriously gapped as Silence-Lotto and now Team Columbia are full gas at the front. Coming to the finish, a series of attacks went off the front, including Stefan Schumacher, then a big attack by Kim Kirchen that looked like it might stick with 250 meters to go, but Alejandro Valverde showed amazing closing speed, reeled in and rocketed past Kirchen and took the stage and the first yellow jersey of the 2008 Tour. Astana teammates Antonio Colom and Alexandre Vinokourov finished one-two in Digne-les-Bains today, the second time in the last three days that Astana has taken the day's top two podium spots. Colom and Vinokourov were both in a 22-man break that shattered on the Col du Corobin, about 25 kilometers (15 miles) from the day's finish. Colom went first, with Vinokourov bridging up and away from the likes of Tom Boonen, Magnus Backstedt, Stef Clement, Rik Verbrugghe, and Leonardo Duque. Over the top, the Astanas had 35 seconds, which got out as far as a minute, but fell to 15 seconds at the finish, where Leonardo “L.” Duque was charging. The main field, which had trailed the break by 6:30 at one point, finished 3:26 back, with AG2R doing the lion's share in protection of Christophe Moreau's 2nd place overall. Moreau, the 2001 Dauphiné champ, has a good shot at overall victory with a very mountainous stage tomorrow. The main impact of the stage on the overall classification was to catapult Vinokourov back into the Top 10, even after he lost more than 7 minutes on yesterday's stage to the summit of Mont Ventoux. Abandoning during the stage were Alejandro Valverde and Bobby Julich. Caisse d'Epargne's Alejandro Valverde, who finished 2nd-to-last on yesterday's climb to Mont Ventoux despite being an early Tour de France favorite, abandoned on the road at the Dauphiné Libéré today. Caisse d'Epargne team leader Alejandro Valverde will make an unscheduled start in September's Vuelta a España, which must have organizers rubbing their hands together in glee. The 26-year-old, knocked out of the Tour de France yesterday with a broken collarbone, went down when teammate Oscar Pereiro clipped his front wheel as other riders slowed ahead. George Hincapie apparently didn't realize the danger when he rode Pereiro's wheel to victory in Stage 15 of last year's Tour. Fast Freddie Rodriguez of Davitamon-Lotto, a 3-time U.S. champion, and Erik Dekker, a 4-time Tour stage winner (including 3 in the 2000 Tour alone), have abandoned the race after an accident on today's 3rd stage. In a later accident, race favorite Alejandro Valverde of Caisse d'Epargne broke his right collarbone, and was taken away in an ambulance. Jerome Pineau of Bouygues Telecom, former yellow jersey Jens Voigt of CSC, Unai Etxebarria of Euskaltel-Euskadi, Christophe Laurent of Agritubel, and José Luis Arrieta of AG2R are about 4:30 off the front. Voigt is one of the riders being tracked on the Ubilabs Google Maps mashup. Pineau has taken max climber's points over the first climb, while Voigt went hard to take the 6 seconds (and 6 points) at the first two sprint lines. At the day's second climb, a 3rd Category, Pineau again took max points, ahead of Etxebarria, Laurent, and Voigt. Fast Freddie Rodriguez was involved in a crash, apparently with Rabobank's Erik Dekker. Doctors were looking at Rodriguez' right collarbone, and Dekker had facial injuries. Both have been taken away by ambulance, and are both out of this year's Tour. Rodriguez was Robbie McEwen's leadout man, although McEwen seems just as likely to use another sprinter for that. Dekker was probably in his final Tour at 35. The day's last intermediate sprint went to Arrieta ahead of Voigt and Laurent. That means Boonen's only chance to move up to the yellow jersey is to make 5 seconds on a finish line bonus. First takes 20 seconds, second takes 12, and third is 8 seconds. Backstedt and Pozzatto have both been at the back of the pack today. I was hoping Backstedt was taking it easy yesterday in preparation for an effort today, but it may be he's not in good Tour shape. Gap is down to less than 2 minutes, but Jerome Pineau led the break over the day's 4th climb, so he's currently leading the King of the Mountains competition, with a 3rd Category and 4th Category climb to go. With less than 20 kilometers to go, it's down to 1:20, and the breakaway is splitting. Laurent was first to attack; Arrieta bridged, and Voigt finally came across. Etxebarria and Pineau have fallen off the back. There's a big crash in the peloton. Alejandro Valverde has hit the pavement! He's sitting on the roadside in obvious pain. Again, they're looking at his right collarbone. He was the oddsmakers favorite to take the Tour, and a smart pick for today's stage as well. They've brought a stretcher and Valverde, one of the sport's rising superstars, is out of the Tour in Stage 3. Meanwhile, Arrieta has attacked out of the leading group of 3. He leads over the day's 5th climb, 10 seconds up on Agritubel's Christophe Laurent and 15 seconds on Voigt. Etxebarria and Pineau are in no-man's land with the peloton at 1:15 behind Arrieta. The Tour website reports that Stuart O'Grady has been involved in yet another accident, but the OLN broadcasters haven't mentioned it. Laurent is caught, Voigt is caught, and only Arrieta is still up the road. Boonen is just off the front of the pack, Michael Boogerd is right there, and the gap is down to 49 seconds with 5 kilometers to ride. O'Grady is off the back, so it looks like he was caught in an accident, but he's back on the bike. Arrieta is rocking as the peloton closes him down. Arrieta has 14 seconds in hand. He's onto the Cauberg, and a Credit Agricole rider has tried to bridge. Oscar Friere, Michael Boogerd, Philippe Gilbert, and Tom Boonen (all Benelux riders or on Benelux teams) are killing themselves up the Cauberg as they capture Arrieta. Sandy Casar has punctured on the Cauberg. The Française des Jeux leader will lose a minute or more on the day. T-Mobile's Matthias Kessler attacks out of the local boys! He takes the points over the top of the Cauberg, ahead of Sebastian Joly and Michael Boogerd. After getting caught with 50 meters yesterday, he's attacked with 2 kilometers to ride today. At the 1 kilometer mark he's got a few seconds in hand, and the Cauberg has broken up the leadout trains. This one may work. Kessler is going hard all the way to the line, and he's got the win for T-Mobile. The select group that survived over the Cauberg is coming just behind, and there's another T-Mobile rider who takes the sprint. It's Australia's world TT champion, Michael Rogers, just ahead of Daniele Bennati of Lampre. There's a wealth of great photos available from the prologue. I thought the quality of shots on Flickr had taken a quantum leap forward, but it turns out some joker just uploaded Graham Watson's pictures to his own account. Still, Francois Schnell has a nice group of Tour snaps from yesterday; I love the composition of this one. (l-r) Leipheimer, Landis, Hincapie from GrahamWatson.com prologue gallery. Also, Apple offers a nice profile of Graham Watson, who touts the company's Aperture workflow software. (l-r) Moreau, Valverde, Hushovd, one for the ladies from BikeZen's Prologue Gallery. The revelation of the Tour for me so far is Caroline Yang. Here's the entry page for her prologue pictures, and she also shot the Tour in 2005 and in 2004. (l-r) Joly, Bruseghin, and Backstedt from cyclingnews.com Prologue photo gallery. Also, the saddest car in Strasbourg. The 1998 Tour has nothing on this year's edition, as both favorites and at least one other team leader have been withdrawn from the Tour by their teams. Teams are scrambling to reshuffle after all 21 teams agreed to ban all riders named in the Operación Puerto report, including Ivan Basso, Jan Ullrich, and Francisco Mancebo. The named riders won't be replaced on their team's Tour roster. T-Mobile has suspended Ullrich, Oscar Sevilla, and DS Rudy Pevanage. "Astaná-Würth is a bit more complicated because there are so many names from that team being linked to the doping probe," added the Frenchman. "Some of those implicated are on the Tour, and some are not. To us, it looks like they have been operating a team doping policy." Oddsmakers are working out the results, and currently have Alejandro Valverde as the favorite, at 6.4-1. It's going to be an amazing Tour. I am obligated, as a writer for a Tour-centric web site, to make some predictions. This year, it is incredibly hard. A lot of riders either have badly screwed up their preparation or haven't shown us what they can do this season (and another, Alexandre Vinokourov, hasn't and may not get the chance to), and we won't find out which it is for a week or 10 days. Sitting here, three days from Strasbourg, I believe in the two favorites, Ivan Basso and Jan Ullrich. I believe in Francisco Mancebo. Alejandro Valverde may be the future of the sport (depending on what's in those damn bags), and he's at the point in his career to break out some surprises. These guys have all shown they're ready to rock and roll. For some reason, I don't really believe in Levi Leipheimer. Gorgeous wife, great results, but I have to agree with his DS: Top 10 probably, Top 5 maybe. Floyd Landis and Alexandre Vinokourov both flummoxed me with sub-par Dauphiné results, but I want to believe. Total wildcards: Denis Menchov, Iban Mayo, Cadel Evans. I think Evans will finish higest of these three, but Mayo could take a spotlight stage, like l'Alpe d'Huez. I can't read Johan Bruyneel's mind any better than anyone else, but I suspect Popovych and Azevedo will be the two most highly-placed Discovery Channel riders. Savoldelli and Hincapie will be well-placed up to the mountains, then lose time to the better climbers. I don't see Ullrich gaining 4 minutes on Basso in the TTs, and here's why: The Stage 7 TT profile. It's long enough, at 52 kilometers, but it's a fairly technical course. Even if it's dry, I could easily see Ullrich overcooking a couple of corners, getting out of his rhythm, and not going as fast as he's capable. If it rains, even worse. I could also see Basso gaining some time on stages with downhill finishes, like Stage 17, where Basso could go over the top of the Col de Joux-Plane with time in hand and conserve all or most of that lead for the 12 kilometers into Morzine. Ullrich's bike-handling has always scared me. I'm also discounting the Floyd Landis nay-sayers, who say he's got no team. I think with a race as open as this year's, the team strength matters less. Landis needs to identify the real team leaders fast, then cover moves only by the real GC threats. Remember Armstrong watching Vinokourov go up the road, and waiting for Ullrich and Klöden (T-Mobile's “official” GC threats) to bring him back? Same idea. There are plenty of other strong riders who will be chasing down the pretenders. Gerolsteiner's Levi Leipheimer took one of the most important Tour warmups, while Credit Agricole's Thor Hushovd took a confidence-building stage win ahead of his effort to repeat as the Tour sprint jersey champion. CSC's Stuart O'Grady, QuickStep's Amer-Italian Guido Trenti, and Agritubel's Coutouly were in an early breakaway, that got more than 4:30 on the field. O'Grady survived almost to the bitter end, with Credit Agricole, AG2R, and eventually QuickStep driving the peloton hard. O'Grady was reabsorbed with about 2-3 kilometers to ride. Hushovd took the field sprint ahead of Samuel Dumoulin of AG2R, Philippe Gilbert of Française des Jeux, and Discovery Channel's George Hincapie. "That we could win it this year says a lot about myself and a lot about Gerolsteiner as a team." "This win will give them and me a lot of confidence in the Tour. Leipheimer and especially 2nd place finisher Christophe Moreau showed they're coming into the Tour in terrific climbing shape, and 3rd place rider Bernhard Kohl of T-Mobile is the revelation of the race, finishing 2:51 behind Leipheimer. Discovery Channel's Jose Azevedo was 4th; he's a dark horse for the Tour. Other Tour names in the top 20: Francisco Mancebo of AG2R in 5th; Denis Menchov of Rabobank in 6th, despite an injury in yesterday's stage; Alejandro Valverde in 7th at 4:21; George Hincapie 10th at 6:48; Sylvain Chavanel 12th; Iban Mayo 16th at 11:00. A couple of Tour favorites were here, but nowhere to be seen when the action heated up: Floyd Landis finished 60th overall, at 57:06, Alexandre Vinokourov was 49th at 51:08. On the first major climbing stage of the Criterium du Dauphiné Libéré, Rabobank's Denis Menchov showed form last seen in the 2005 Vuelta a España, and Christophe Moreau showed form unseen in years to lead the peloton up the Giant of Provence. Menchov narrowly held off Moreau at the very top of the climb. A number of early favorites saw their shot at a Dauphiné title fall by the wayside, including Floyd Landis, who finished a disappointing 56th, 9:30 back of Menchov. His Girona neighbor Dave Zabriskie actually outclimbed Landis, finishing 50th at 8:10. Alexandre Vinokourov was 81st at 13:10, while Iban Mayo was 65th at 10:35; both have won this race (Vino in 1999; Mayo in 2004). On the other hand, Levi Leipheimer showed he used his time out of racing to good advantage, and finished 3rd on the day, just 15 seconds behind Menchov. That was good enough to put him in the race lead, 28 seconds ahead of Menchov, and 1:08 ahead of Stage 2 winner Philippe Gilbert of Française des Jeux, still hanging around after a creditable 38th today. José Azevedo, who was in an early attack with 9 kilometers to ride, didn't explode when the leaders came through, and took 4th on the day. Moreau's AG2R teammate Francisco Mancebo was 7th on the day, at 1:04, while George Hincapie and Alejandro Valverde finished together, 18th and 20th, 3:13 back. Kind of says it all right there in the headline, no? BiciRace.com offers a preview of the placings in this year's Tour, still 4 weeks away. Maybe it's no surprise their Italian pride leads them to go with Basso, then Ullrich. A bigger surprise is the 3rd step, where they choose the World's Fastest Mennonite, Floyd Landis. I'm not ready to count Ullrich out until we see him do some Tour de Suisse climbs, but Basso's Giro was indeed pretty impressive. As for Landis, I hope the possible exclusion of Botero and Gutierrez doesn't prove too distracting. BiciRace puts 3 Americans in the Top 8. Click through to see who, and where. Today's stage at the Criterium du Dauphiné Libéré is a short, flat, 4-kilometer prologue. Gerolsteiner's Sebastian Lang took the early lead in around 4:42. One big surprise is Bradley Wiggins, the Cofidis rider who has already predicted he'll win the 2006 Tour prologue. Wiggins was able to do only a 4:46, 4 seconds slower than Lang, with a lot of strong riders to come. Stuart O'Grady comes through in 4:41.9, and takes the stage lead! It won't stand up, but this is a guy who broke 5 ribs and his collarbone March 9th at Tirreno-Adriatico. Cyclingnews has a good interview with O'Grady from mid-May. Thomas Dekker doesn't even go top 10, and again, there are a lot of riders to come. Zabriskie is quickest at the turnaround. Coming to the line with a big cushion to O'Grady; 4:35.83 for Zabriskie! That one might stand up. Alejandro Valverde is on course, all in white as the ProTour leader. Chris Horner comes in at 4:50.45. Valverde does a 4:43, dropping him into 6th for now. As soon as Valverde came in, George Hincapie left the start house. We'll see how his recovery is coming. Landis is on course, sporting the Praying Landis, Vinokourov is on course, Leipheimer is on course, and Cycling.TV has gone black. D'Oh! There comes Mayo, the last guy on the course, and he's not going to go anywhere near Dave Z.
Zabriskie takes the stage win! Hincapie, who took last year's Dauphiné prologue, is 2nd in 4:37.62. O'Grady 3rd, Lang 4th. Posthuma 5th, Stijn Devolder was 6th. Valverde 7th. Landis 9th in 4:43.84. The Cycling.TV guys say Zabriskie hasn't raced since March, but I've got pictures that say otherwise. Coverage is still in and out, so I don't have Leipheimer or Vinokourov's results. We're just a few days from the race that's become the most important Tour warm-up, the Dauphiné Libéré. Cycling4All has a running start list, and there are few surprises. Lots of Americans have team leader numbers, including Levi Leipheimer, David Zabriskie at CSC, and Chris Horner at Davitamon-Lotto. It's a South American riding in Phonak's lowest number, Santiago Botero, although of course Floyd Landis is using the race to test his fitness before the Tour. Yaroslav Popovych wears 31 for Discovery, which also brings George Hincapie and Jose Azevedo. Vinokourov and Kaschechkin both will start for the team formerly known as Liberty Seguros, while Alejandro Valverde leads Caisse d'Espargne. Missing riders? Quick Step's Tom Boonen, Davitamon-Lotto's Robbie McEwen, and T-Mobile's Jan Ullrich, as well as Giro d'Italia champion Ivan Basso. Some of these guys have 4 weeks of racing in their legs since April 20: A lot of the Saunier Duval (Pinotti, Olson) and Davitamon-Lotto riders (Henk Vogels, Jan Kuyckx, Nick Gates, Van Hecke) started both the Tour de Georgia and the Giro d'Italia. Action kicks off Sunday with a 4-km prologue in Annecy. Though 37-year-old Lars Michaelsen took the win at the Tour de Georgia Tuesday, the youth movement continues apace in Europe. Caisse d'Espargne's Alejandro Valverde took his first classics win at Fleche Wallonne, beating CSC's Karsten Kroon and Euskaltel's Samuel Sanchez in the closing meters of the climb of the Mur de Huy. 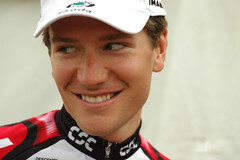 Paris-Roubaix winner Frank Schleck was 4th. 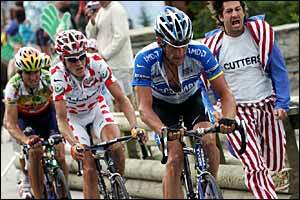 Fat Cyclist wins our “Earliest Tour preview” sweepstakes with a quick overview of the contenders for the 2006 race. Like him, I really discount George Hincapie's chances for the overall win, but Hincapie is still talking about the possibility he could lead Discovery for the Tour. Alejandro Valverde is an outstanding young rider with incredible potential, and I would strongly recommend rooting for him, except for one thing. His team’s name is “Caisse d'Epargne-Illes Balears,” for crying out loud. I have no idea how to even pronounce that, and there’s no chance whatsoever that I would successfully spell it. In fact, it is my understanding that everyone on the team is required to wear extra-large jerseys, just to make room for the team logo. procycling | Valverde to miss Vuelta? Spain's budding superstar, Alejandro Valverde, expected to be a favorite at next month's Vuelta a España, may have to miss his national tour. 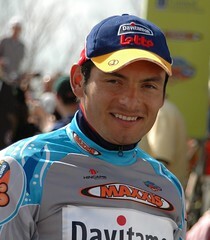 Valverde is still recovering from tendinitis that forced him out of the 2005 Tour during Stage 13. Valverde and his team are reportedly refocusing their late-season goals on the world championships in Madrid, despite the race profile, which is expected to favor full-on sprinters. 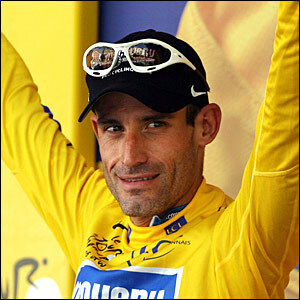 Valverde has finished 3rd and 4th in two Vueltas. So, what's next for the Tour? Atop the race organization, Christian Prudhomme takes over for Jean-Marie Leblanc. Atop the podium, who knows? "Nobody will take over from Lance, simply because there's no candidate." "I find it very exciting to ride with riders of the new generation. Some of them are really exceptional but the most impressive I think is Alejandro Valverde," said Julich. "He has so much natural class, he's a pleasure to see. He needs to test himself at the highest level of the Tour but he is one of the riders I will be thrilled to watch in the future. Also Ivan and Tom Boonen." "Jan is a special, special guy to me," Armstrong said. "I truly believe that Jan can win the Tour again, not just once but more than once. "Clearly he has to show up to the event in a little better shape, because what you see toward the end of the event is the guy who can win the race." ...we can only watch and see when Moreau drops off the pace and how soon Basso takes that 3rd-place for himself and perhaps attacks Rasmussen for his second place. It would have been a lot more exciting to have a Spaniard up there with these guys, for we are on the frontier with Spain and there will be hundreds of thousands of Spaniards waiting to cheer their men on. Valverde has been at the back of the peloton for most of the stage. The leader of the Best Young Rider classification is about to abandon his first Tour de France. The winner of the stage to Courchevel has just abandoned the Tour de France. He has been ill for the past couple of days. He stepped into the Illes Balears team car in the feedzone. "I'm in good condition, but it's impossible with my knee," he said. "I guess it's better to stop now. It's already a great achievement to win a stage like Courchevel," he told journalists before the stage start. Valverde said he might take part in the Spanish Vuelta if his knee condition permitted. There have been a couple of opportunistic breakaways this morning, with the biggest being an attack from Alexandre Vinokourov, who is now riding with Santiago Botero and Oscar Pereiro of Phonak, and Egoi Martinez of Euskaltel-Euskadi. Initially, their group also included Francisco Mancebo, Roberto Heras, Pietro Caucchioli, and Chris Horner, but those four were dropped on the Madeleine. Pereiro had a dramatic off-road experience going off the side of the road on the descent, and down a small hill. He was able to come back up, get on board, and recapture the break. Thor Hushovd (!) and Samuel Dumoulin also spent some time in front. Presumably, Hushovd had an eye toward the first intermediate sprint of the day, but he's been picked up by the main field. Green jersey Tom Boonen crashed again, around 10 kilometers into the stage. The race doctor spent time working on his knee, and Guido Trenti spent quite a while pacing Boonen back to the field. On the Col de la Madeleine, Botero took max mountain points, followed by Vinokourov, Pereiro, Martinez, and then Christophe Moreau and Michael Rasmussen in the peloton. Discovery shucked a lot of riders on the day's first climb, but there are still 6 or 7 Discos driving the field. There may be 40 riders in the Armstrong group, and they're letting Botero and Vinokourov's group sit around 1:30 up the road. They must be able to see them on some of these roads. Vinokourov picks up a 6 second time bonus at the sprint line; his group is closing on a 2 minute gap to the peloton. They're also closing on the Col du Telegraphe -- time to climb. Egoi Martinez is off the lead group early on the Telegraphe, and now so is Botero. Botero battles back up to Vino and Pereiro! The trio is 1:58 in front of Armstrong's group, which includes Rubiera, Savoldelli, Popovych, Hincapie, and Beltran, and Azevedo. Jean-Patrick Nazon and Kim Kirchen have both abandoned today. On the Galibier, Quick Step's Stefano Zanini joins them. As the lead three hit the summit of the Telegraphe, their gap has stretched to almost 3 minutes. Ullrich, Valverde, Basso, Klöden, Landis, Leipheimer, Rasmussen, Moreau, and Chris Horner are all still in the 40-strong Armstrong group. Botero again gets max mountain points, then Vinokourov, then Pereiro. On the Galibier, Vinokourov and Botero have dropped Pereiro; looks like he's toasted. Mayo keeps falling off the Armstrong group. The gap reached 3:30, but it's coming down now, at about 3:00. Beltran has finally fallen off the lead group. Down to 26 riders in the Armstrong group. Vinokourov is 3:15 up on Armstrong with 6 kilometers to the top. I don't think Armstrong can count on catching Vinokourov on the descent. Rubiera is popped. Armstrong catches Pereiro; Horner is off the back; Armstrong has Azevedo, Hincapie, Popovych and Savoldelli. The gap is 3:06. Armstrong's group is down below 20 with 4 supporting Discos. Guerini is off the back with Klöden and Michael Rogers. The gap has dropped to 2:47. Vinokourov is going to take the Henri Desgrange prize for the first man to the Tour's highest point. Less than 1 kilometer to the top for Vino. Armstrong has lost another Disco. Botero continues to struggle in between Vinokourov and the chasers. He may catch Vinokourov on the descent. Vino is first over, Botero is :38 seconds back. Rasmussen has launched an attack and has a good gap on Armstrong. Rasmussen showed us his descending skills the other day. It's going to be an interesting run-in to Briançon. I'm starting a new post for the last 40 k; if you've been reloading this page, check the home page for the new post.